KRYTAR’s directional couplers are uniquely designed for systems applications where external levelling, precise monitoring, signal mixing or swept transmission and reflection measurements are required. 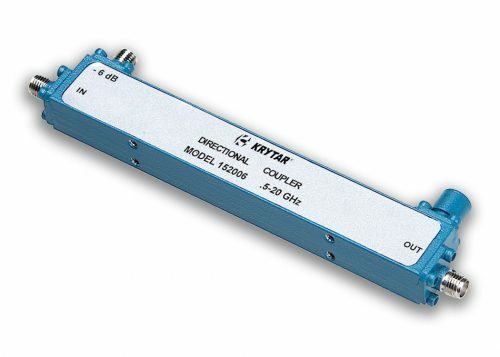 KRYTAR’s latest addition, Model 152006, enhances the selection of multi-purpose, stripline designs that exhibit excellent coupling over the wideband frequency range of 0.5 to 20.0 GHz in a single, compact and lightweight package. In addition, Model 152006 offers superior performance ratings including Nominal Coupling (with respect to output) of 6 dB, ±1.0 dB, and Frequency Sensitivity of ±1.0 dB. The directional coupler exhibits Insertion Loss (including coupled power) of less than 2.1 dB, Directivity of greater than 12 dB, Maximum VSWR (any port) is 1.35, Input Power Rating is 20 W average and 3 kW peak. The directional coupler comes with industry-standard SMA Female connectors. SMA Male and N-Type Female connector options are available. The compact package measures just 4.49 inches (L) x 0.53 inches (W) x 0.71 inches (H) and weighs only 3.1 ounces. 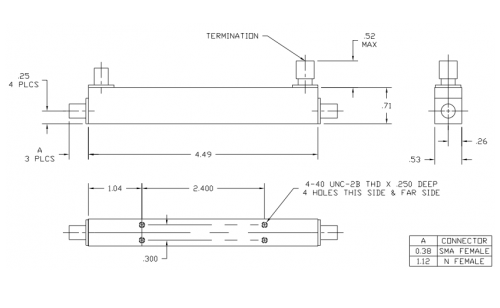 Operating temperature is -54° to +85° C.
KRYTAR’s coupler is uniquely designed for systems applications where external levelling, precise monitoring, signal mixing or swept transmission and reflection measurements are required. KRYTAR couplers offer solutions for many wideband applications including electronic warfare (EW), commercial wireless, SATCOM, radar, signal monitoring and measurement, antenna beam forming, and EMC testing environments. For many space-restricted applications, the compact size makes KRYTAR directional couplers ideal solutions. This wideband directional coupler can also be manufactured to meet rigid military specifications. KRYTAR also offers complete engineering services for custom designs that meet or exceed critical performance and/or packaging specifications. Directional Couplers: Components that allow two microwave circuits to be combined into one integrated system in one direction with the two completely isolated from each other in the opposite direction. Couplers are passive microwave components used for distributing or combining microwave signals. Directional couplers are four-port circuits where one port is isolated from the input port. The coupled port on a microstrip, or stripline directional coupler, is closest to the input port because it is a backward wave coupler. On a waveguide broadwall directional coupler, the coupled port is closest to the output port because it is a forward wave coupler. VSWR is defined as the ratio of the maximum voltage to the minimum voltage in standing wave pattern along the length of a transmission line structure. It varies from 1 to (plus) infinity and is always positive. Insertion Loss is the net unrecoverable power in dB dissipated within the circuit at any frequency within the specified range. Frequency Sensitivity is the amount of frequency change in the carrier frequency per unit amplitude change in the message signal. Krytar Directional Couplers: Term Definitions, Testing, and Typical Applications.